James Corden and 'unfortunate looking' Ed Sheeran are the perfect British duo on Carpool Karaoke. 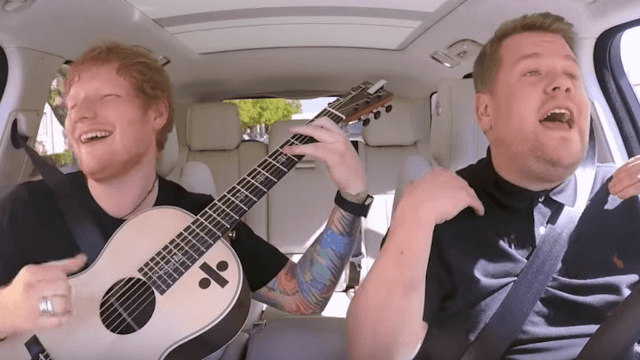 The time has finally come for Ed Sheeran to hop into James Corden's passenger seat for his edition of Carpool Karaoke, and the segment was definitely worth the wait. Corden and Sheeran drove around Los Angeles while belting out songs by Justin Bieber, One Direction, and, of course, plenty of the singer/songwriter's own hits. They jam! They harmonize! They stuff Maltese chocolates in their mouths until they nearly choke! Speaking of The Biebs, Sheeran recalls a ridiculous story where he tried to hit a golf ball out of the "Baby" singer's mouth while drunk and ended up cracking him in the face. "I was like focus focus focus, you can't hit him, you can't hit him, you can't hit him." Yeah, he hit him. But Bieber didn't seem to mind much. "He was actually really cool about it, surprisingly," recalled Sheeran. "He was like 'ah, bro!' and then carried on." Sheeran also opened up about being an ugly duckling who used his guitar to get girls. "I’ve kind of been glued to this guitar since I was 11-years-old and it’s just been a way that if it ever feels awkward I just bring it out. I was quite an unfortunate looking kid and I feel like God was like 'You need help getting laid, mate.'" The comment elicited a sympathetic "awww!" from the audience, but don't worry guys. He seems to be doing pretty okay for himself. But the most surprising thing to come out of this episode of Carpool Karaoke is Ed Sheeran revealing that he does not have a phone. Oh yeah? Then how are you getting all those pictures of your cats onto your Instagram account, Ed? Ed Sheeran is currently on his world-tour, and James Corden is traveling a bit himself. This week the Brit returns home to London for three very special episodes of The Late Late Show, on every evening at 12:37am.